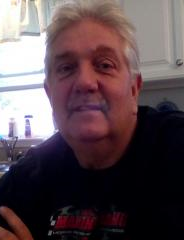 George “Goose” Minor Morris 61 of Waggoner passed away Jan 31, 2019 at St. John Hospital in Springfield. He was born Aug. 31, 1957 in Springfield IL., to Dempsey Hutchison and Mary Joann Morris. He was a graduate of Elk Garden High School in West Virginia. He worked at Pillsbury Mills in Springfield, owned Goose’s Video in Farmersville and was a machinist at Henry Technology in Chatham. George put family and community first, and was caring and always willing to help anyone in need. George’s passion was Mopars and he enjoyed sharing that knowledge with everyone. He had a love of drag racing and was a member of NHRA and was a founding member of the Waggoner Car Show. He is survived by one daughter Miranda (Steve) Honigman of Springfield and one son Christopher (Dana) Morris of Raymond, 7 grandchildren Brayden Andrew Morris, Kinley Ree Morris and Regan Danae Morris, Olivia Rene Honigman, Abigail Nicole Honigman, Devin Michael Honigman and Lillian Paige Honigman and two brothers Steven Ray Morris Spaulding IL and David Keith (Gloria) Morris Beaver Creek OH. Memorials can be directed to Bank and Trust in memory of George Morris. Visitation will be Tuesday Feb 5, 2019 at Pleasant Hill Christian Church in Raymond from 4-8 PM. Funeral service will be Wednesday Feb. 6, 2019 at 10:00 AM at the church with Rev. Dave Ziegenbein officiating.